Brings a Sea of Visual Magic to S.J. SAN JOSE CALIFORNIA - BROADWAY SAN JOSE, a Netherlander Presentation, made a splash by starting its 20l7-20l8 season with Disney THE LITTLE MERMAID, specially with the children who were one third of the audience that filled the S.J. Center for the Performing Arts on opening night. With Music by ALAN MENKEN, Lyrics by HOWARD ASHMAN & GLENN SLATER, and book by DOUG WRIGHT, this “Exclusive Northern California presentation of the new musical production,” visually, is fantastic. 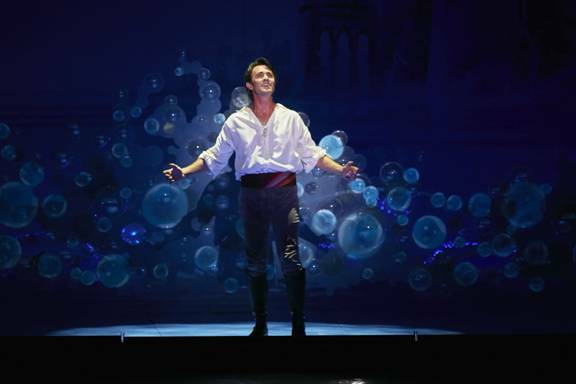 Every set (KENNETH FOY) is so realistic that can easily transport the audience, vicariously, to all the places we visit, among them: the sea, represented by a blue ocean with mountains made out of bubbles at the bottom. The waters are constantly crisscrossed by swimming creatures: anemones, electric eels, a pulp ( if we dare to call Witch Ursula (JENNIFER AllEN) by that name) a crab (MELVIN ABSTON) King Triton (STEVE BLANCHARD) his siren daughters, Aquatea (MELISSA GLASGOW, Andrina (KRISTIN BURCH) Arista (BRENNA WAGNER) Atina (BECCA ORTS) Adella (AMANDA MINANO and Alana (TAYLOR NIEMEYER) Ariel ‘s older sisters, and Founder (MARCO RAMOS) her best friend, to name a few. The sets also shows us the seashore. There we see charming seagull (VENNY CARRANZA) and two of his friends (MICHAEL McGURK and KC FREDERICKS) first flying above the sea, and later on, talking and even singing as a trio while performing a rhythmic tap dance. In a different set, floating on the ocean, we see the Royal ship with prince Eric (ERIC KUNZE) at the wheel. We overhear him telling his sailors that he doesn’t want to be a prince because he prefers sailing. The ship is a sight to see. Back on the ground, another set represents a river, where sitting in a rowing boat Ariel and Eric get acquainted with each other. Other sets show us the interior of the elegant rooms of the Prince's palace with hanging crystal candelabrum hanging from the roof. Adding to the visual effect of the sets on THE LITTLE MERMAID are the costumes (AMY CLARK & MARK KOSS) which are colorful, elegant and true to life. Some of the best ones: Sebastian’s crab costume, the seagulls’ feather costumes, and Ursula’s costume as an Octopus with enormous tentacles. Written by writer HANS CHRISTIAN ANDERSEN (l805-l875) who was born in Odense, Funen, Kingdom of Denmark Norway, as one of his famous fairy tales, “THE LITTLE MERMAID” is the story of Ariel, a mermaid who does not want to be a mermaid, who collects artifacts that she finds in the sea. One day as she is swimming on the surface looking for them , what she finds is Prince Eric, floating on the water, after been thrown from his ship to the sea during a storm. She falls in love with him at first sight, and to conquer his love, she gives her beautiful voice to Ursula, the sea witch, in exchange for legs. The Witch converts her to human, but leaves her silent. She gives Ariel three days to woo the prince and warns her that if in that time, the prince had not kiss her, Ariel will become a siren again and Ursula’s slave. Disney’s THE LITTLE MERMAID, was first realeased as an animated feature film in l989, and years later on Broadway, as a stage musical, where it opened in the year 2008. The version of THE LITTLE MERMAID we saw, was good but not perfect. On opening night, playing the overture, the musicians missed a few notes, and during the performance some of the singers, including Ursula and Ariel, were not always clear in the vocalizations of their lyrics. But overall, the cast was professional. All the singers’ voices have quality, and all the actors sang their songs with the required emotion. We will select, however, KUNZE ABSTON, and BLANCHARD for their marvelous tone of voice, their perfect diction, and their excellent interpretation of their songs. The overall acting in the musical was natural. A little exaggerated by Ursula (ALLEN) but it was good because the children, interviewed after the show, said that they like her instead of being afraid of her. Also exaggerated,was the role of Chef Louis, but he made the audience laugh, so it was fine. 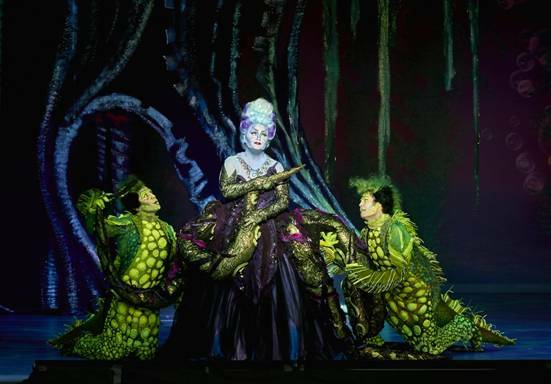 The outstanding performances, on opening night were many: KUNZE in the role of prince, Sebastian (ABSTON) as the crab, BLANCHARD as King Triton, and HUEY as Ariel. 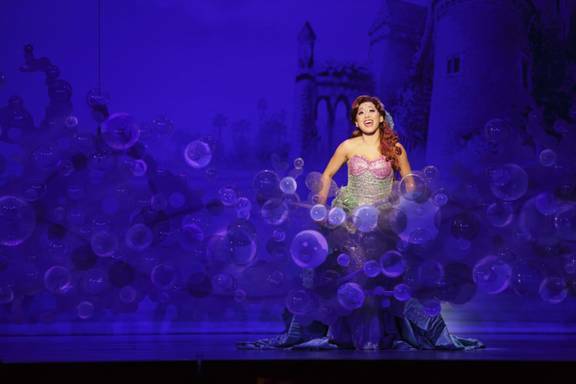 The long standing ovation the show received on its opening night, demonstrates that Disney THE LITTLE MERMAID made a splash in San Jose.. 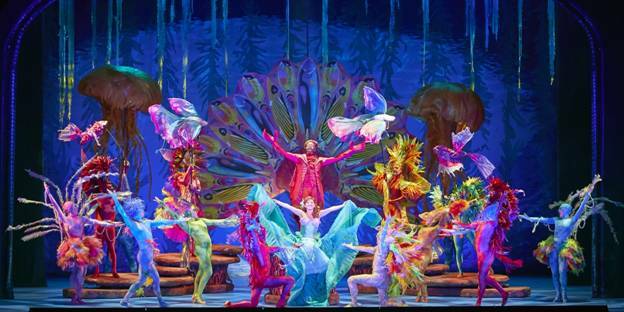 THE LITTLE MERMAID will be shown at THE SAN JOSE CENTER FOR THE PERFORMING ARTS, 255 S Almaden Blvd. in S.J. until October 1. For tickets go to you can go online to www.broadwaysanjose.com or order by phone by calling: (800) 982-2787.